Award exemplifies character, learning, and citizenship. Each spring Lakeshore Technical College holds their annual graduation banquet in Northeast Wisconsin. It is a chance for the students to introduce themselves to the dairy industry and thank their families, host dairy farms, and mentors who helped them on their path to graduation. The activities and results of their competitions at state and national contests are shared with the crowd as well. A highlight of the evening is the Hoard’s Dairyman Award presentation. The large plaque depicts the Foster Mothers of the Human Race painting. Each winner’s name is engraved on the award that hangs in the college’s dairy department. A smaller plaque is also presented to the winner for the recipient to keep. While there are numerous recognitions that students can receive inside and outside the classroom for various talents, the Hoard’s Dairyman Award is somewhat different. First of all, it is the only so named award. No other college or university presents one, just Lakeshore Technical College. The award is voted on by fellow students who apply a 1 to 10 score in these three categories for each of their classmates. In reference to academics, it is not based on grades or test scores. Instead, it considers the ability to obtain and implement ideas presented in class. In other words, how well do they “connect the dots” from textbook learning to hands-on implementation. Additionally, their involvement in class activities is considered. The final category is community. Here students evaluate their peers for their aggressiveness to obtain their career-orientated goals. It considers if they were involved in club, school, and community activities. Annually a Hoard’s Dairyman staffer attends the banquet and presents the award. Past winners also often attend the banquet in anticipation for the next year’s winner to be named. A member of the college’s administrative staff (not the professors) tallies the scores and contacts the trophy shop directly. They are given strict instructions to engrave the name on the plaque, but cover the winner’s name so it can be unveiled for the first time at the banquet. This year there were nine students who graduated from Lakeshore Technical College. 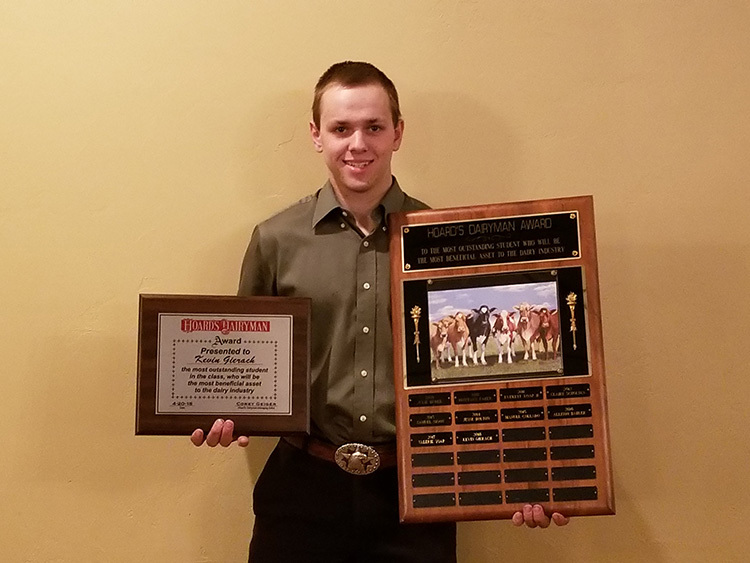 And the Hoard’s Dairyman Award winner was Kevin Gierach from Mequon, Wis. From the Hoard’s Dairyman team, we congratulate Kevin on all his hard work, graduation, and recognition by his peers. The author is the online media manager and is responsible for the website, webinars, and social media. A graduate of Modesto Junior College and Fresno State, she was raised on a California dairy and frequently blogs on youth programs and consumer issues.